Mobile and social game company Game Insight has announced the launch of Battle Towers on iOS devices. Previously released on Android, the game has attracted over 2 million players, as gamers work to construct buildings and collect resources in their battle against units of a rival clan. The game offers both solo and multiplayer gameplay, as users can challenge each other for superiority across platforms. In this level-based real-time strategy game, players enter a war between Order and Chaos, rival factions whose differences have become impossible to fix. The game’s day and night cycle sees Order units strongest during the day and Chaos units stronger at night, challenging players to alter their strategy on the fly as time passes in each battle. During battle, players construct resource-producing buildings and defensive towers, and can recruit armies of warriors to head into combat against the enemy. Magic spells are also available to strengthen units and increase their chance of survival. The game’s player-vs-player mode is available across platforms, so users on Android can battle those on iOS. 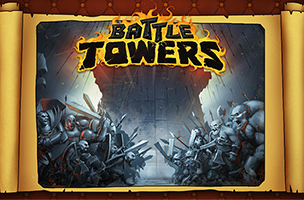 Battle Towers is now available to download for free on iOS. The title is one of many Game Insight will release for iOS devices this year, as the company recently announced X-Mercs: Invasion for iPad, and has released The Tribez & Castlez on both iOS and Android, among others. Check back soon to follow Game Insight’s titles on AppData, our tracking platform for mobile and social apps and developers.